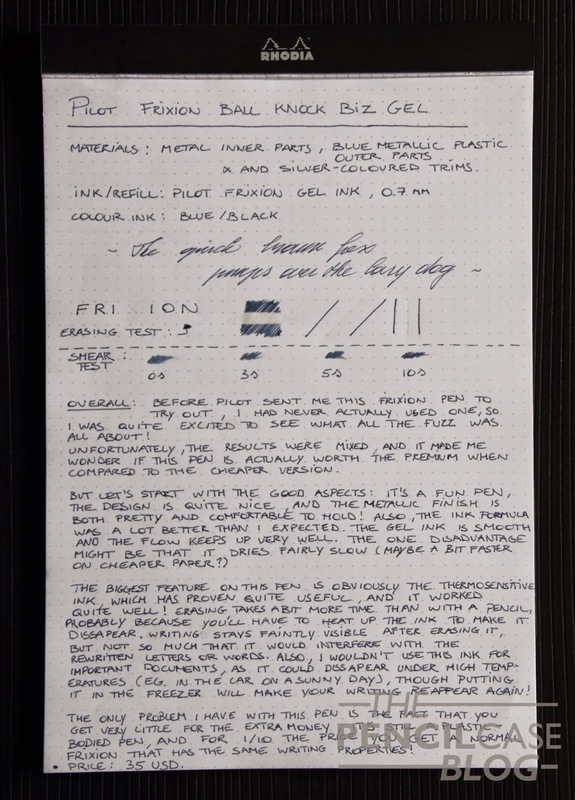 Before Pilot sent me this Frixion ball Biz to try out, I had never actually used a Frixion pen, so I was quite excited to see what all the fuzz was about! 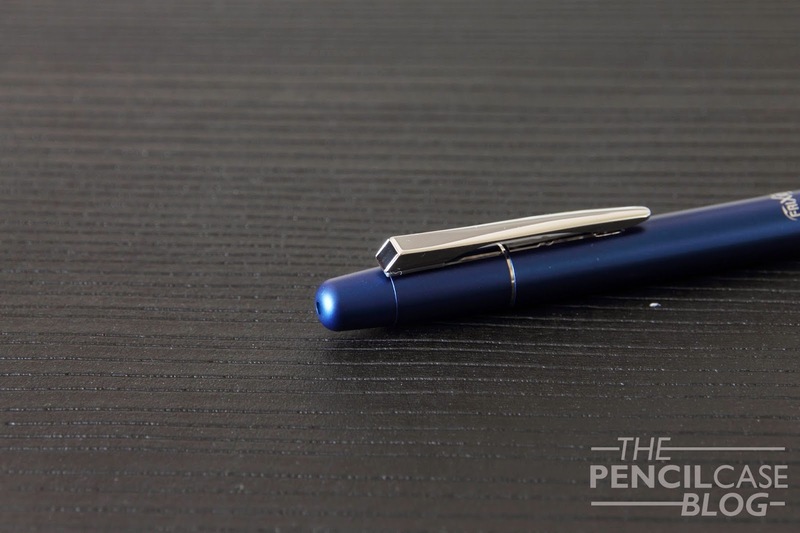 Unfortunately, the results were mixed, and it made me wonder if this pen is actually worth the premium when compared to the much cheaper versions! But let's start out with the good things! 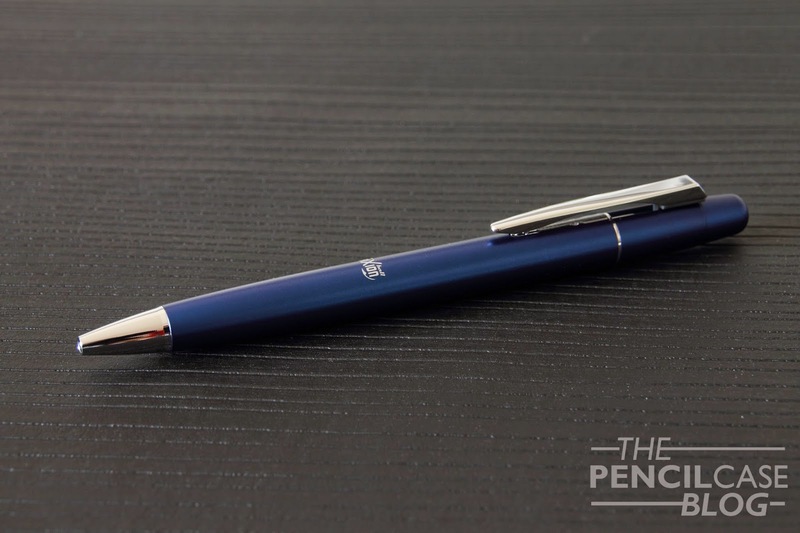 It's a fun pen, the design is quite nice, and the metallic finish is both pretty and comfortable to hold! 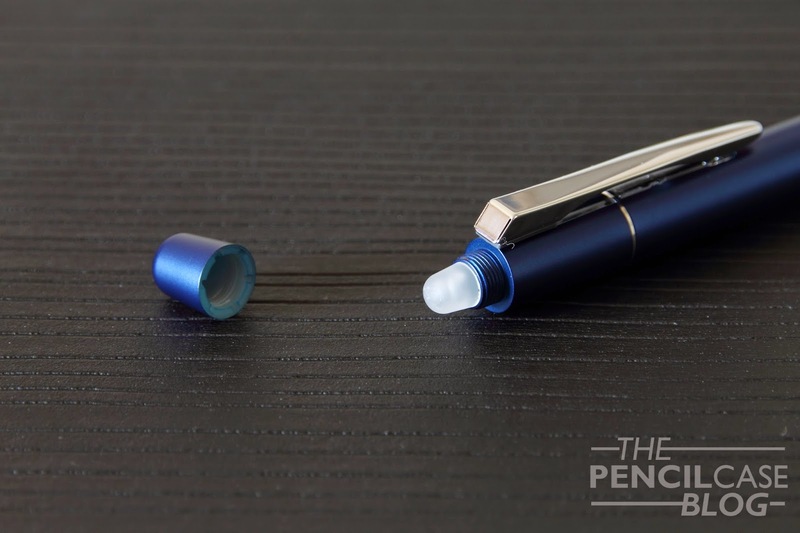 Especially the clip is a really neat feature, as the top of the pen is occupied by the 'eraser' under a blind cap, they had to place the retract mechanism somewhere else. The clip now doubles as the knock mechanism. Simply push the clip down, and out comes the tip! The Biz is quite long, and it's surprisingly heavy. At first I thought the pen was completely made out of metal. But that turned out wrong. The body and inner parts are all metal, except for the top part of the pen and the small blind cap over the eraser. All parts do fit together nicely, and overall, it feels quite solid. The pen is tapered towards bottom and top, and despite the fact that it looks quite slim, it really isn't, or at least it doesn't feel that way! There's no dedicated grip section, but despite the missing grip it's quite comfortable to use. When it comes to looks, there was only one real downside: the frixion logo on the barrel! It looks so unprofessional, so with that in mind they -kinda- failed to make a professional-looking pen. But obviously, the biggest feature on this pen is the thermosensitive ink, which has proven quite useful, and it worked quite well! Erasing takes a bit more time and pressure than with normal pencil marks. The ink needs friction, and thus heat to become invisible, so it isn't anywhere near the same principle as erasing a pencil line! The writing does stay faintly visible after you erased it, not so much that it will interfere with rewritten lines though. Also, I wouldn't use this ink for important documents, as it could become invisible under high enough temperatures (E.g. in a car on a sunny day) Furtunately, simply putting it in the freezer will make your writing reappear again! 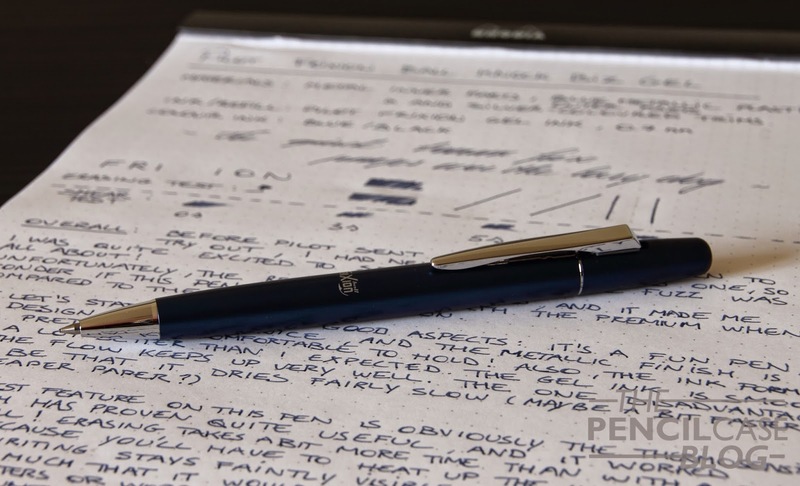 As I mentioned in the beginning of the review, the only real problem I have with this specific 'Biz' version, is that it doesn't add much value to the -almost same- disposable frixion pens. The refill appears to be exactly the same, so the erasing functionality doesn't change, though at only one tenth the price of this version, I think the disposable pens are the better way to go. 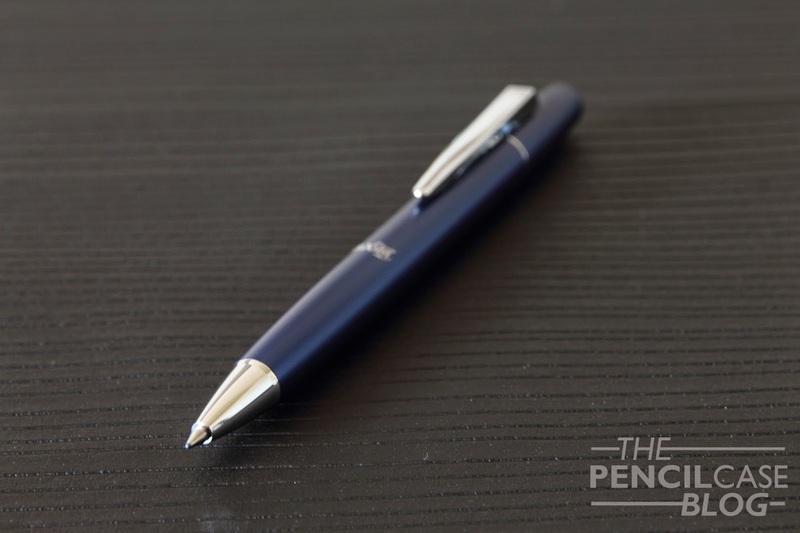 The general idea behind the Frixion pens is good, much better than I had expected. But this particular Biz model leaves a bit to be desired! The price point just isn't justified in my eyes. If you have never used a Frixion pen before, I'd strongly suggest checking out the 'cheapo' disposable plastic version first. Try it, and see wether you like it or not. If you are a fan of the concept, and you want something a bit fancier, the Biz might be a good idea!